Mantova hut, opened in 1984, is owned by Alpine Guides Gressoney. It is located 3.498 meters above sea level on the Garstelet glacier. After 24 years, the hut has been renovated to improve the comfort of guests as well as the working conditions of the staff. To reach this goal the Gressoney’s Guides, together with the architects Binel and Quattrocchio, decided to build a new annex on the west side of the hut, with a basement and a floor above ground. The structure, built of reinforced concrete in the basement, was completed with a modern wooden structure on the ground floor. The new building is linked to the old one trough stairs that get to the rooms in the old building. The toilets, which previously stood outside, are now in the basement. Another important novelty, which is very unusual for most of the huts, are the three new showers only for our guests. Also the staff can finally have private toilets. Always in the basement there is a new room where climbers can change theirselves and leave their equipment. Here was built also a warehouse that will contain an adequate raw materials for the management and a water tank with a capacity of about 40,000 litres, that has a great importance for the hut when the temperature drops below the zero degrees. On the ground floor a spacious dining room with a magnificent view of Monte Rosa can host almost 100 guests and correspond now to the numbers of beds, which are 90. The old dining room, although very friendly, had a capacity of 40 seats and obliged to wait on dinner in two separate rounds, something unpleasant for those who, instead of quietly rest after eating, were obliged to leave the table giving the place to the mountaineers of the second round. Beside the dining room was built a new kitchen, geared like the kitchen of a big hotel. Finally, in the old dining room and kitchen have been built the staff rooms and two rooms for the mountain guides, to offer all the comforts at the people who spend a lot of time in the hut. 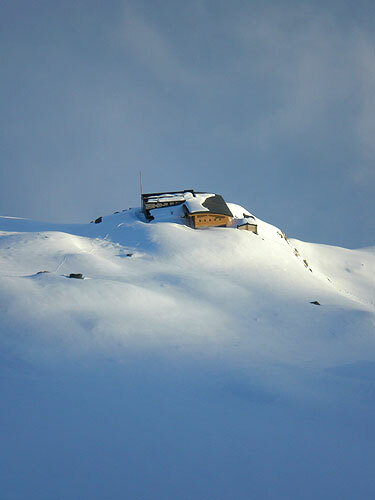 The renovation of the hut has been done with the purpose of answer at best to the needs of mountaineers about comforts. Gressoney’s Alpine Guideswant to thank all the companies that have worked to realise this ambitious project, knowing that it was not easy to work and overcome all the difficulties that can be found at 3.500 meters.